Rokit Boost’s latest audio innovation, the Rectangle Bluetooth Speaker, is setting the standard for quality and affordability in a crowded consumer accessory marketplace this holiday season. It combines a multi-purpose design and Bluetooth and non-Bluetooth capabilities to make for the perfect holiday gift. It’s getting close to the holiday season, and Rokit Boost is giving consumers everywhere yet another reason to rejoice. The mobile lifestyle accessory innovator is raising the bar for sound this holiday season with the Rokit Boost Rectangle, a Bluetooth speaker that’s the perfect blend of quality, portability, multiuse applications, and ease on the wallet. Featuring a sleek, compact style and ergonomic design enabling use in the office, at home, or on-the-go, the Rectangle delivers exceptional value in its unmatched sound experience, superior audio clarity, and uncompromising quality. That’s all available for under $40.00, and ships for Free. Bluetooth v.3.0 makes the Rectangle compatible with the iPhone, iPad, iPod, Android, BlackBerry device line, or any device with Bluetooth capabilities. Weighing in at just 215 grams (.5 pounds), it’s easily taken anywhere, anytime. A built-in microphone, remote control-less functionality, and a 3.5mm line-in for non-Bluetooth devices also demonstrate the Rectangle’s all-around attractiveness. In other words, whether a gift or a perfect holiday accessory, it’s the perfect option for those wanting topshelf quality but not looking to break the bank. 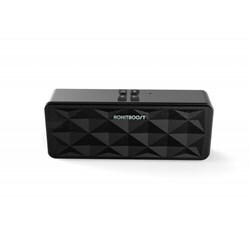 The Rokit Boost Rectangle bluetooth speaker takes any holiday party to the next level. A simple wireless pairing enables partygoers to turn on the music of the season and set the mood. Don’t have a Bluetooth-enabled device? No problem- just plug the audio source into the auxiliary plug-in to liven up those smaller get-togethers or even larger occasions for merrymaking. Avoid the mad dash of holiday shopping by giving the latest innovation in audio that’s for both business and entertainment. The Rectangle’s built-in microphone and lightweight design make it ideal for conference calls, online chatting, or music or video viewing during those downtimes. It doesn’t require a remote control for operation, as it controls everything from playlists to streaming music stations and more effortlessly. Power, volume, and skip controls on top, and DSP for noise reduction and echo cancellation make the Rectangle a top holiday gift option for the most seasoned holiday shopper or busiest professional. In line with Rokit Boost’s commitment to peerless customer service, there is a 1-year warranty on the Rectangle as well. The Rectangle is priced at $39.99, available at RokitBoost.com and select retailers. Rokit Boost is offering Free Shipping this holiday season and a 1 year warranty on all products. Rokit Boost is a tech company, focusing on improving electronic devices. Whether an iPhone charger case, Bluetooth headphones, or a wireless Bluetooth speaker/microphone, our products focus on improving existing technologies. Our team believes.